파이어폭스 add-on 을 만들어 보자. 일단 extension 을 위해 폴더를 하나 만들자. 여기서는 ‘easypost’ 라는 이름을 사용한다. 그리고 이제 manifest.json 을 하나 만들자. 보통 아래와 같은 모습을 한다. 아래 manifest.json 에 명시되어 잇는 icons/border-48.png 와 easypost.js 는 일단 아무거나 만들어 넣으면 된다. 그럼 아래와 같은 구조가 된다. 여기서 중요한 것은 content_scripts 부분이다. content_scripts 부분에서는 matches 에 해당하는 url 에 가게 되면 content 부분에 script 를 적용해 준다. 주소창에 about:debugging 를 치고 들어가면 우측상단에 “Load Temporary Add-on” 를 확인할 수 있다. “Load Temporary Add-on” 를 누르고, easypost.js 를 선택해주면 extension 이 load 된다. 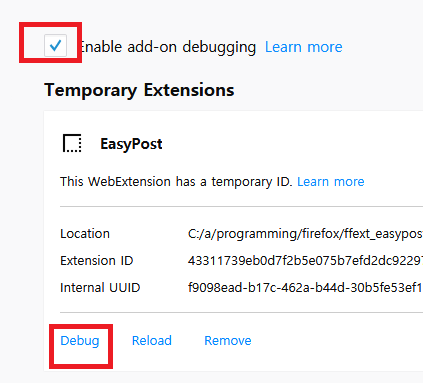 주소창에 about:debugging 에서 "Enable add-on debugging" 을 check 해주고, Debug 를 누르자. 그러면 Development 창이 뜬다. 이제 아무 tab 에서 원하는 page 로 들어가서 test 를 하면 된다. 아래 소스를 보면 알 수 있다. manifest.json 이 아래처럼 되어 있다. page_action 은 URL bar(주소창) 에 button(또는 popup) 을 만들어 준다. 그래서 이 button 을 누른경우 background 의 js 가 실행되게 된다. manifest.json 에서 바로 content_scripts 를 이용해서 page 를 조작할 수 있지만, 그외에는 browser.tabs.executeScript 를 이용하게 된다. 아래처럼 file 의 js 를 불러와서 사용할 수 있다.